I like the laser etching that marks where the wingtip braces go, and where the landing gear wire attaches to the landing gear plate. Also note the lasercut plywood wheels. I like that they don't melt like plastic ones when the retaining washers are soldered on. The parts sheet includes a full size wing pattern to build over (well, two halves...better than the oil and flip way of days gone by). The "decals" are reprints on sticker paper. We'll see how they stick and clear over with dope. Look along the left edge of the last picture...you can barely see the clear turtledeck. 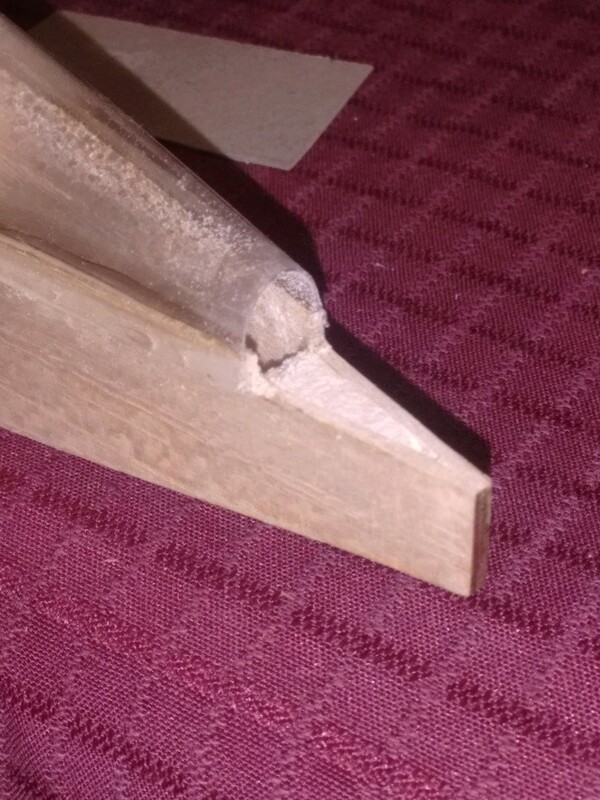 I scabbed the trailing edges together, and made a scarf joint to connect the two leading edge pieces into one long one. Then they got notched, pinned down, and ribs glued in. 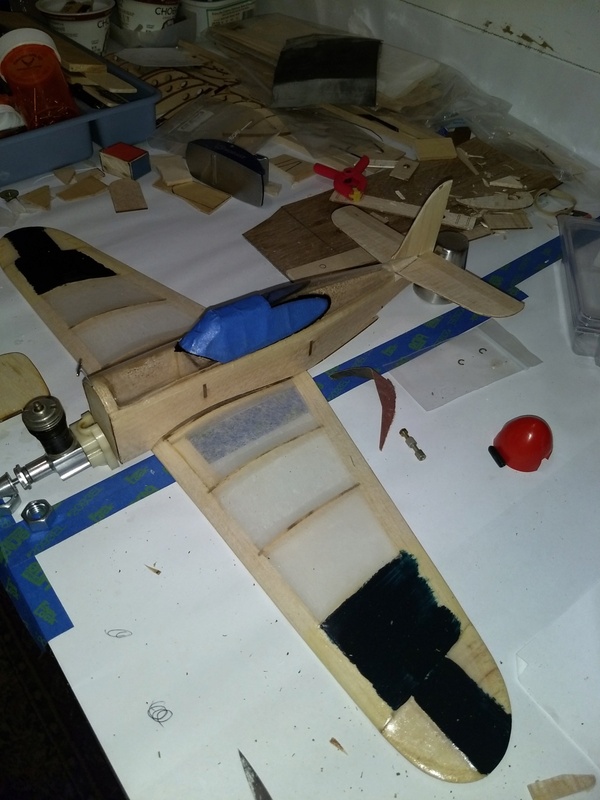 The fuselage was 5 minutes this morning...everything is getting double-glued for durability. I think I'd like to build one of these P-40s. Are they now marketing this kit? Yes he is! His contact info is listed on his website. Tell him you want the Scientific Red Tiger. He also has a few other box fuse, built up wing models. He has a Dauntless bomber and a Mitsubishi Zero listed. Check out the Hellcat in 1/2A on StuntHanger. This kit has just been done, so it isn't listed yet. 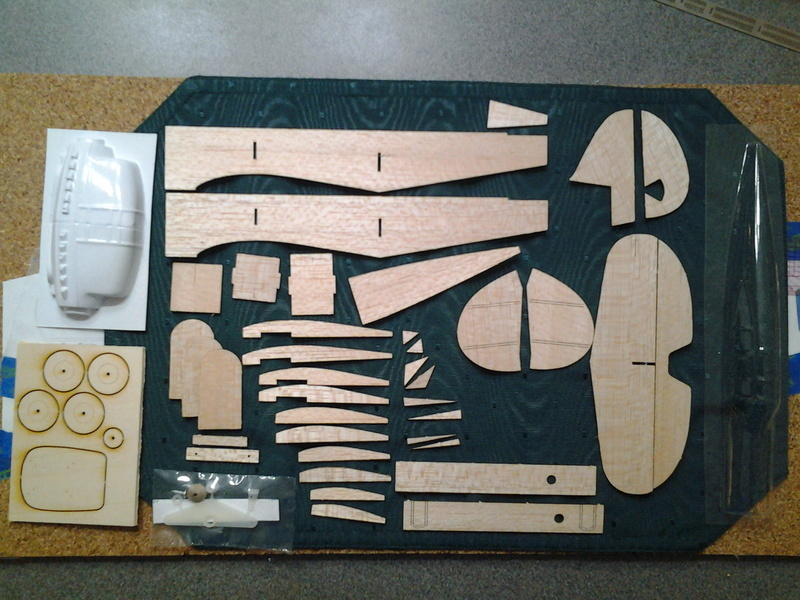 You may want to wait until I finish the kit...mine is the first one off the laser-cutting and vac molding machine. I have No Financial Interest. Cool. Thank you. I'll follow your thread...still have an intense interest in these little planes 50 years after first building them. Wing basically done. 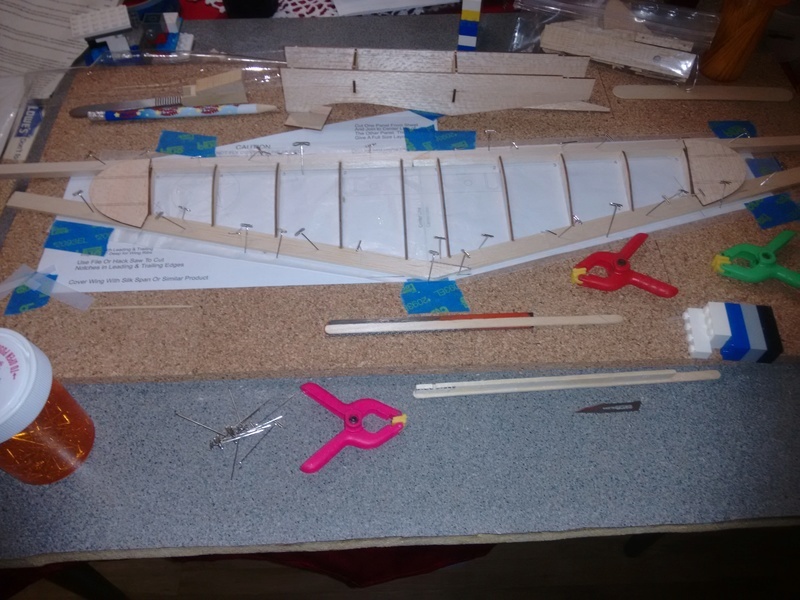 Fuselage close to done. Still have to complete tail group. Stab and elevator will be sewn. Bellcrank/landing gear plate needs to be completed and installed in wing. Paper/Paint will be last, of course. 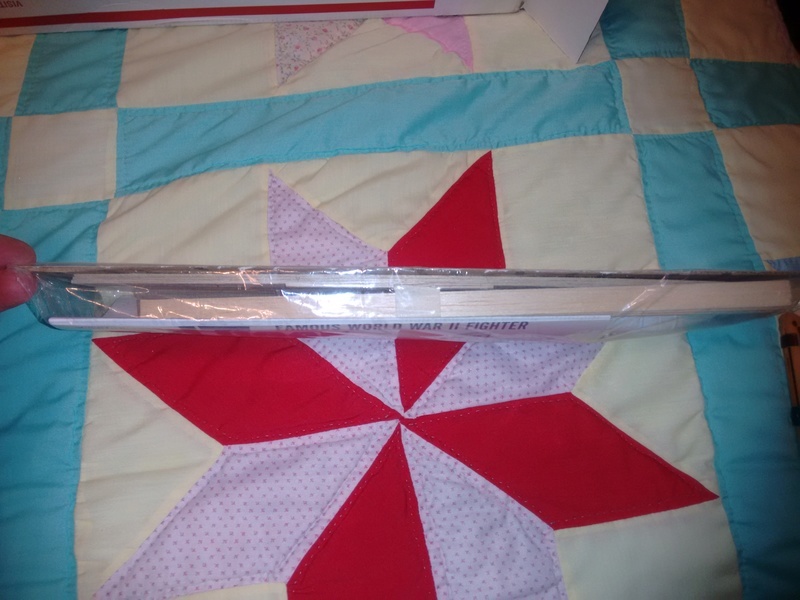 The canopy frame was painted using a paint marker to trace/fill the frame from inside. I practiced with a black Sharpie until I was comfortable with the process. Then the inside was cleaned with denatured alcohol to remove the Sharpie ink prior to the real deal in paint. The outside is masked so when I dope it, the frame is still exposed and visible. The turtle deck HAD a closed end, and the sides of the turtle deck ballooned away from the fuselage uite a bit. The shape didn't fit the box fuselage very well...something about a pointy tail being marginally covered by the wider closed end didn't look all that good. So I chopped the end off in order to pull the sides of the turtle deck tightly against the fuselage. 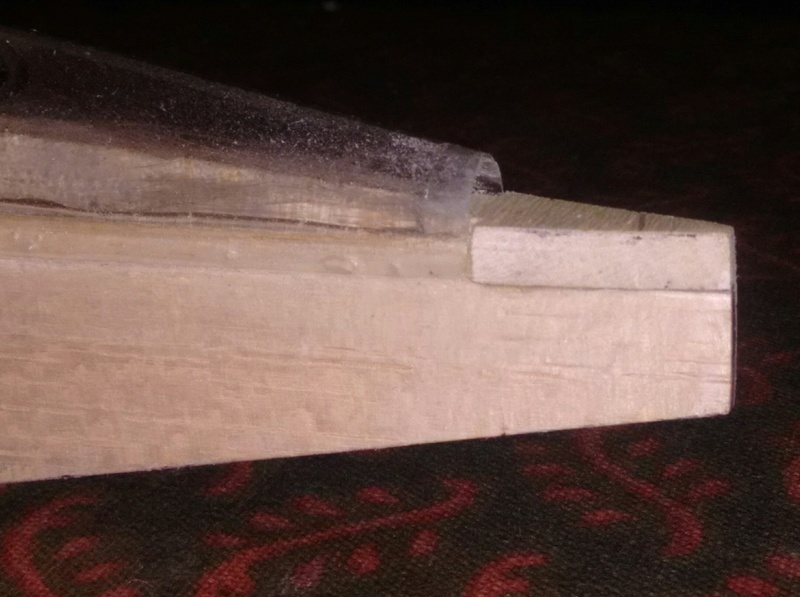 This glued joint is about an 1/8 inch wide overlapping seam all around. I spent two weeks trying to figure out how to glue the seam, and secure the turtle deck until the epoxy cured. I felt tape would not hold the turtle deck in place while the epoxy cured. I also needed a way to ensure epoxy stayed between the turtle deck and the fuselage. Rubber bands would pull the turtle deck down too much...to the point that the sides ballooned out breaking contact with the fuselage. Basically, a jig was made that kept the turtle deck overlap sitting on top of the fuselage sides. The process will be documented when I build the Zero or Hellcat. Since the back of the turtle deck was cut off, I made a two-piece plug to close off the end. The parts will be showcased before final doping. 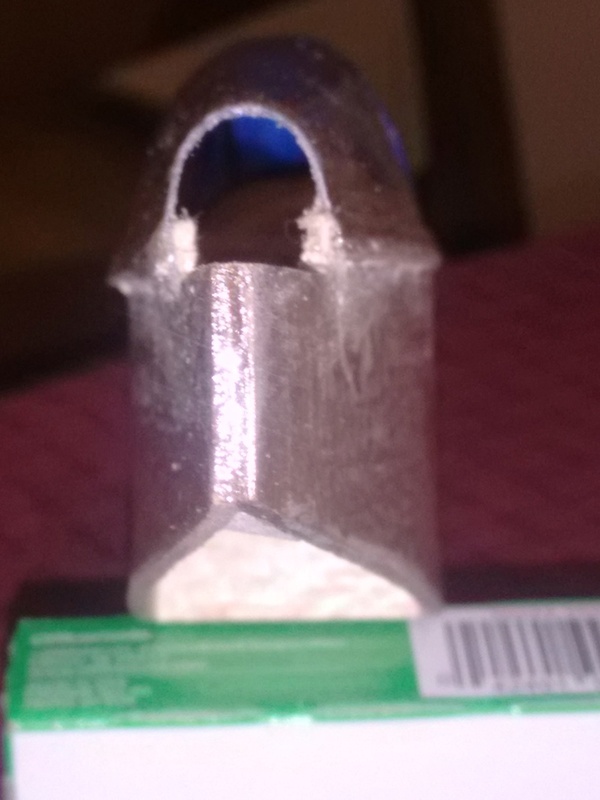 The plug was sanded and shaped so the seam from the turtle deck flows through the plug...really a silly detail since the only way to see it will be to look under the stabilizer after it is fitted. The plug is also keyed with an insert that will slide into the opening in the turtle deck. The major piece is shown in situ...the minor piece will sit on top of the stabilizer. 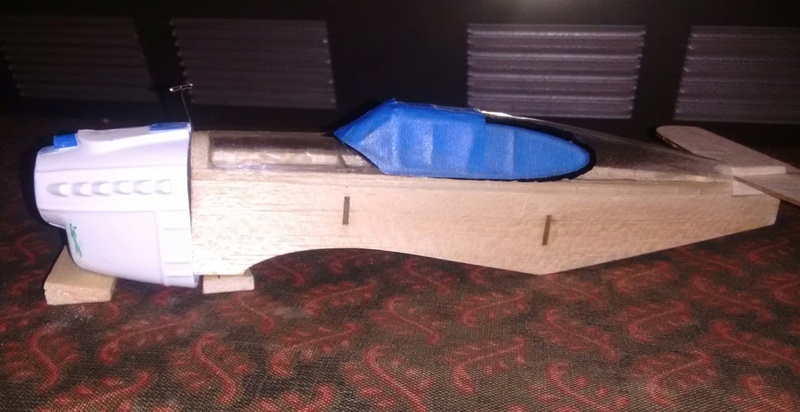 It has been rounded to carry the shape of the turtle deck under the fin/rudder. Since I was basically rebuilding the back end, I took the time to change where the stab sits on the model. I think it is almost 3/16 inch higher than it would have been. 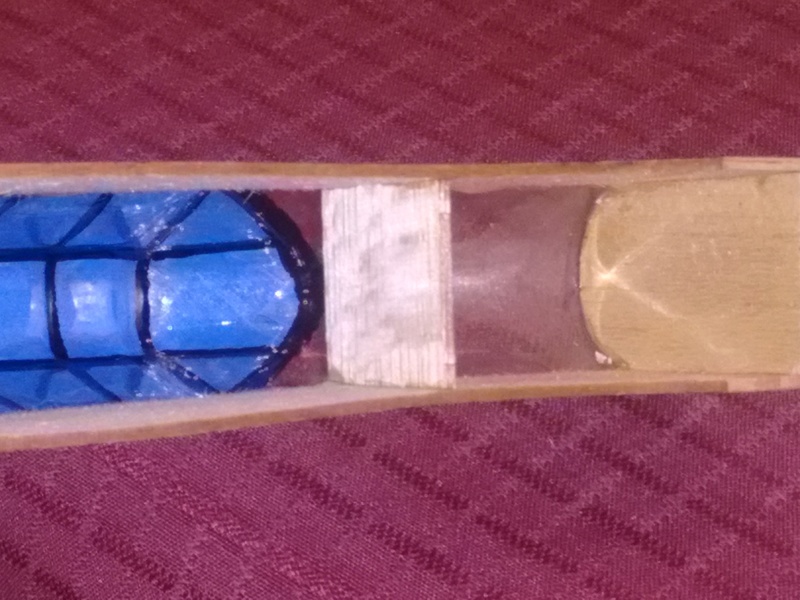 A 1/4 inch piece of flat stock was fitted to the inside of the back end. This will allow me to round off the bottom corners of the fuselage in an attempt to remove that "box" look. It will also allow for a more secure tail wheel mount. I hope the weight penalty is worth the strength! 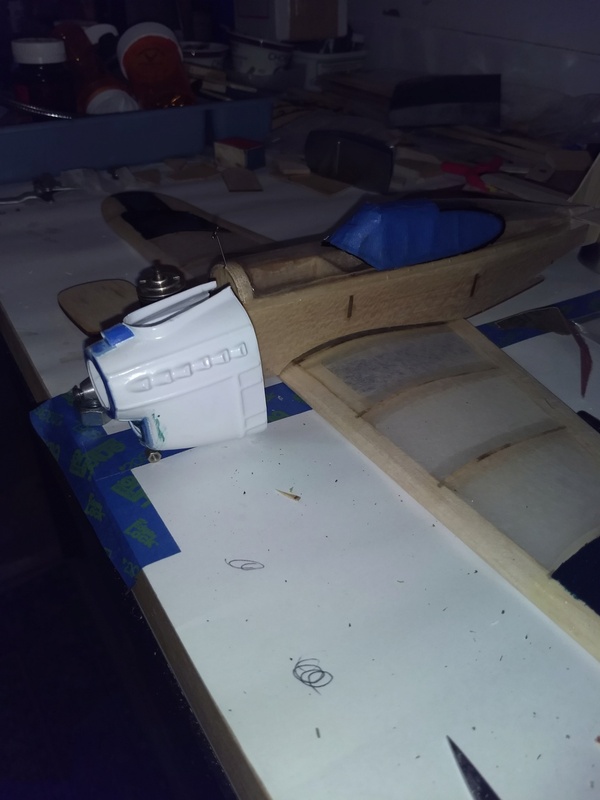 I still need to finish the main gear and install it in the wing. 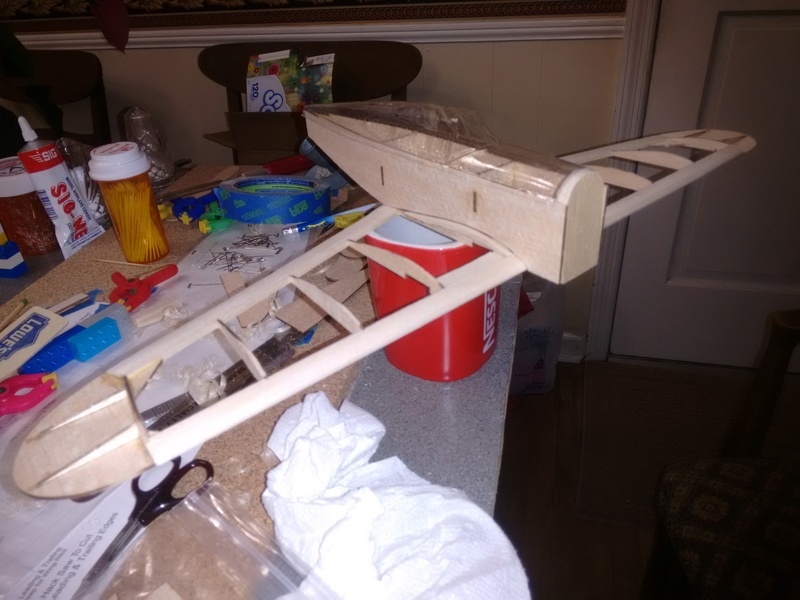 I'm also toying with the idea of making the wing removable...locating dowels and rubber bands may secure the wing for flight. This is still only an option, but one that could potentially make the model more portable for little weight gain. In the end, I'm quite pleased with the canopy/turtle deck install. The rest of the kit is pretty basic. 944_Jim wrote: The canopy frame was painted using a paint marker to trace/fill the frame from inside. I practiced with a black Sharpie until I was comfortable with the process. Then the inside was cleaned with denatured alcohol to remove the Sharpie ink prior to the real deal in paint. 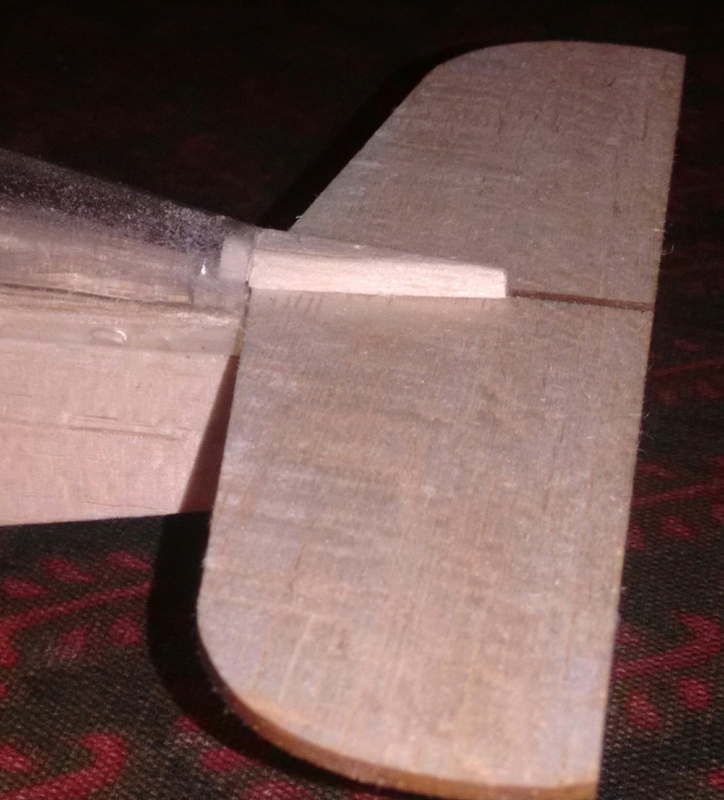 I built a couple of planes with turtle back (Cosmic Wind, Toucan, Lil Roughneck etc. 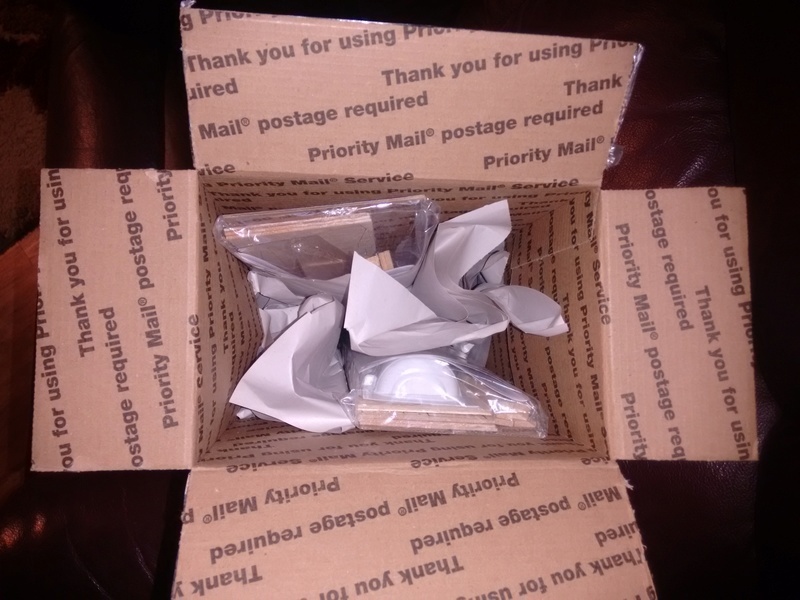 all R/C birds) and the best experience I gained was soaking the balsa sheets in hot water to allow easy bending and prevent ballooning of the back. 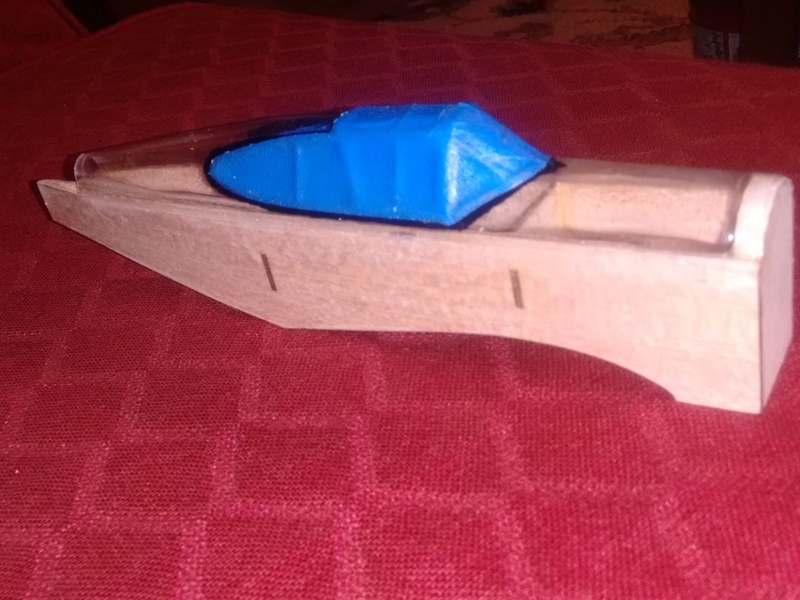 Surprisingly, soaked balsa really bends well without cracking, and CA glue sticks to even wet balsa...(and to wet index and thumb fingers too) Sorry if my advice seems commonsense.. Looking forward to reading all about here on this forum Jim, I don't have the time to visit others. Hopefully Kim will do a forum build too. Nice looking kit there Jim , i will bee watching this to the finish . Thanks for letting us tag a long . new to the forum, but definately watching this one, as I had the original Scientific kit back in the day, not sure what happened to it.... 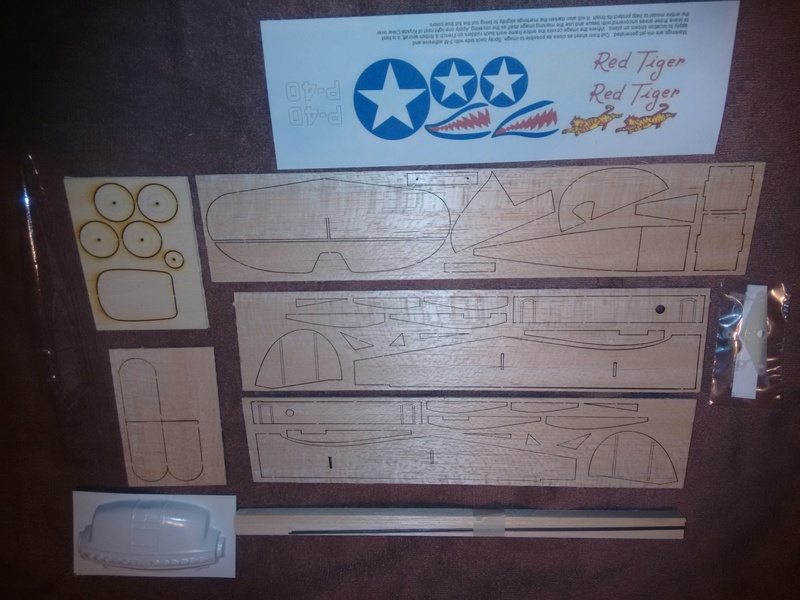 I still have a few of my old airplanes I'm redoing now, This could be my forst airplane kit in 30 years..
Argh! Oh, the shame of it all! I don't know how you found this thread. Worse, I just reviewed time stamps. I have to get this kit finished! Look closely at the wing tips above. I glued the braces upside down. This has the bottom of the tips flush with the bottom of the wing. And, as the tissue shrinlk, the tips draw downward. A couple weeks back (well, maybe a month ago) I cut them off and replaced with slightly thicker balsa, and new braces. The effects are much more presentable (see below). I had originally planned to use a Cox Babe Bee, but have changed my mind. I think the model would be too nose heavy. Not only that, but the engine cowl isn't long enough to cover a Bee. Sizing up a product engine means it should fit just fine. Of course, I'll need to make or source an external tank and place it in the fuselage. I still have access even though the fuse top is hard-glued on. I love the Scientific kits. Find my boys Scientifics here and on RCGroups.com under the same username. They built the profile FW-190 and Typhoon with this same flat bottomed built-up wing (one is in 1/2A, and the other in Control Line forums). 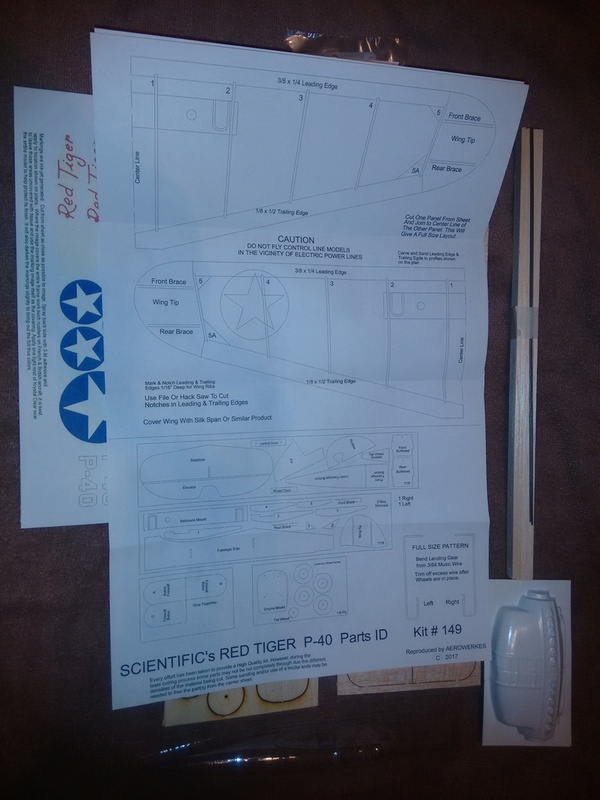 Also look for my Scientific Profile P-40 with symmetrical wing here and RCGroups. It really flies. The YouTube video is under CL_Jim. He'll sell you laser-cut reproductions that go together quite well. I've seen internet posts of his other reproductions, and they all look fabulous. 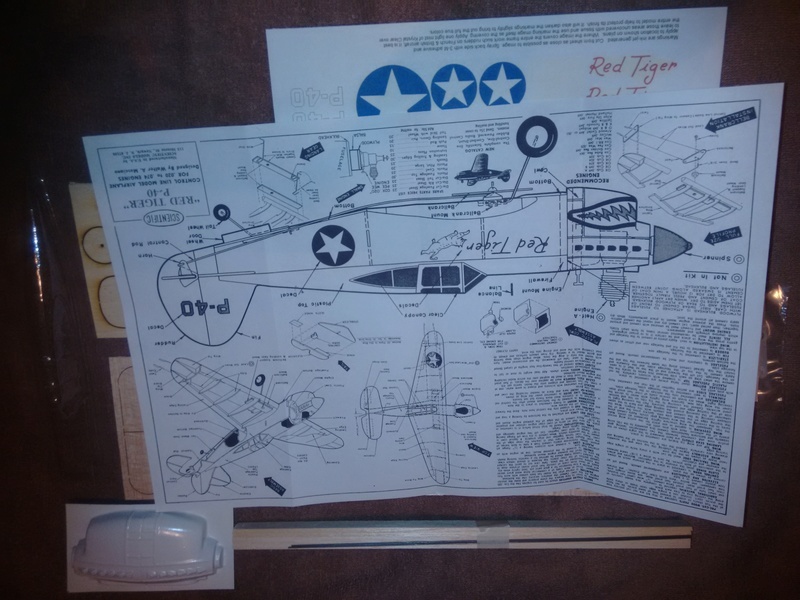 In fact, my first connection to him was to get the Sterling P-38 (still un-built) when I was looking for kits to draw my boys into the hobby. Unfortunately, they didn't enjoy it like I do. Well, here it is a year later...not.much progress, but sometimes life gets in the way. If.you want more.pics or details, just ask! JIm, Thanks for the info / update... And yeah, I did not notice the posts were from Feb, just saw the 2018 and figured it was still 'current' , lol. I dug out my old CL stuff a few years back, started on one of the Stunt Chimp models to try to get back into it, then everything got pushed to the side for a few years, now my grandsons are 9 and 6, gave me an excuse, 9 yr old actually helped me recover and dope my original Lil Satan a few weeks back. If the snow ever melts we'll go fly some. I'll have to drop a note about the Red Tiger kit, like noted, it's one I recall building, seems maybe it was damaged on first try , memory isn't what it was, lol. 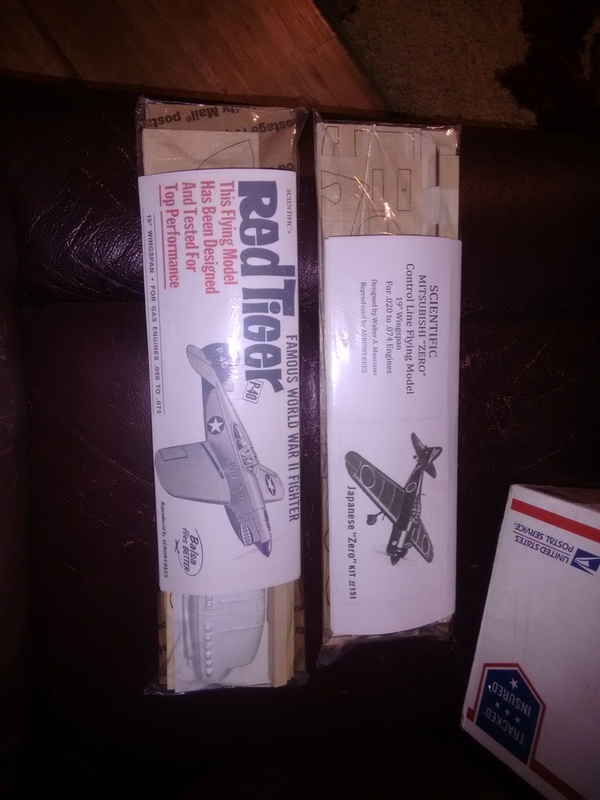 Been trying to find a plan for a plane my brother had - Stuntman or Swordsman type sheet wing 'stunter', but I remember it having the plastic Goldberg type motor mount, positive it was a kit, not modified, so not sure what it was ( no pics of anything back in the day ).. will have to get pics of what I still have. ( thinking I should post this somewhere as an introduction, lol ).